WASHINGTON (Feb. 15, 2008) -- Back in 1971, then 2nd Lt. Jim Campbell began paying off the four years of Army service debt he incurred when he accepted an ROTC scholarship. He worked then as a platoon leader inside the 82nd Airborne Division at Fort Bragg, N.C. He also pulled time as a jumpmaster, making sure Soldiers getting ready to parachute from an aircraft were actually safe to go. He acted as the final check on a Soldier before they plummeted back to Earth. Lt. Gen. Jim Campbell retires March 1 after nearly 37 years of Army service. 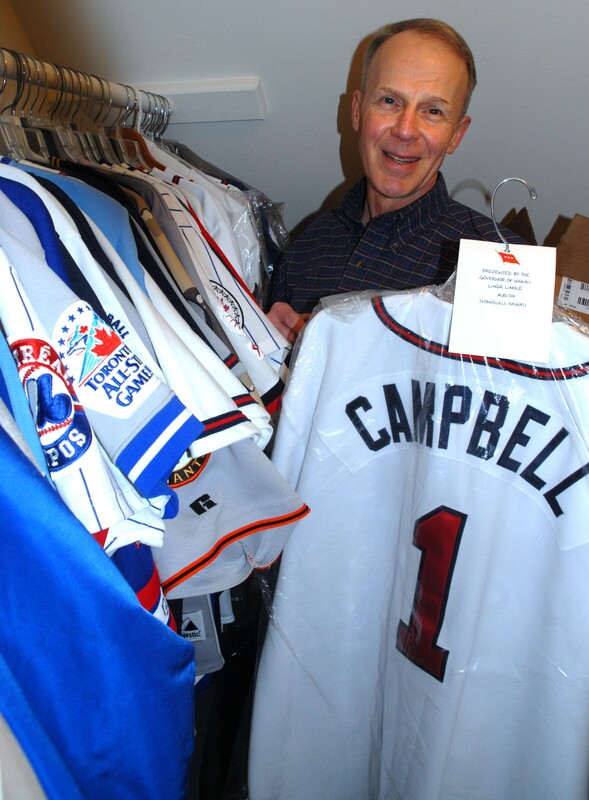 During his career he amassed a collection of baseball memorabilia that includes everything from baseball cards, to bats, to jerseys. The general says after he retires he will travel south to watch spring training with the Atlanta Braves. "I remember the first time those doors opened on an aircraft, and every eye in that aircraft looks at you and the other jumpmaster," said Campbell. "It dawned on me then that the lives of those young men were in my hands, and I had to get it right -- and I loved it. It hooked me, because I loved the responsibility of being in charge of Soldier's lives. I love that challenge. That's why I stayed a Soldier all these years." Nearly 37 years later, Lt. Gen. Campbell, who served last as the director of the Army staff at the Pentagon, reflected on an Army that has changed much since the time he first donned his uniform. In 1973, for instance, the U.S. military eliminated the draft. But the Army still employed many Soldiers that had entered the service involuntarily. "The first time as a platoon leader, I told the platoon sergeant I'd been looking things over and felt we needed to go to the field the next week," Campbell said. "He came back later and said the men had voted and didn't want to go -- it was a different time then." Today, the Army is made of volunteers -- people that want to wear the uniform and want to serve their country. Campbell said that has made a difference in the kind of Soldier that serves today. "People ask me if we should go back to the draft, and my answer is that we should not," he said. "I want to be in something where people want to be there with me. And what I see in the U.S. Army today, across the board, is quality. Young noncommissioned officers, halfway around the world, are making life and death decisions. What that means to the Army is we are going to have the most combat- experienced Army we have ever had. They are incredibly smart, gifted, and talented men and women out there -- the best I have ever seen." Changes implemented in the Army since about 2004 have made the service more modular and easier to manage than it has been in the past, Campbell said. Today, for instance, a commander from one unit can easily command another unit. "I can be the commander of the 10th Mountain Division going into Iraq today and I'd be commanding brigades from the 101st Airborne Division, 25th Infantry Division, and 3rd ID, because they are all 'plug and play'," Campbell said. "It gives you incredible flexibility as a commander." In the past, Campbell said, such units were different in makeup and training standards. That made interoperability between units difficult. "Looking back at the Army I grew up in, every unit was different," he said. "If you had two light outfits, they weren't the same. If you had heavy outfits, they weren't the same either. I credit General Schoomaker with being the father of the modularity concept. His thought was if we can get these outfits looking the same, same structure, same manning, then they become kind of like plug and play. It gives you incredible flexibility, in savings, in maintenance and in adaptability." That advance in organization, he said, has increased the power of the Army. "In my opinion, the modular formation, the brigade combat teams, are so much more lethal, powerful, potent, than the formations we had before," he said. The Army also now keeps those units together when they deploy, something that had not happened for units deployed to places like Vietnam. "I think one of the biggest difficulties during the Vietnam conflict was a series of individual replacements -- stability in the ranks," he said. "You could be in a rifle company and a week wouldn't go by where you wouldn't have a replacement come in or somebody go home because their 12 months was over. You had this constant in and out in your unit." Today, he says, Army units train, deploy and fight together. And the Army is working hard to ensure that even when individual Soldiers change units, they are still allowed to have 12 months of time back home to train and recover. That is one way the Army is now taking better care of its Soldiers, the general said. Looking to the future of the Army, Campbell said the service must continue to focus on the full spectrum of military operations. The Army must continue to fight the kinds of wars being fought now in Iraq, but must also be ready for the kinds of wars America has fought in the past, in places like Vietnam, Korea and Europe. Now he says, the Army is almost totally focused on counter-insurgency operations. "In order for us to restore the strategic flexibility of our nation, and Army, we need to get more of our formation able to do the full-spectrum operations," he said. "You have no choice but to be prepared. In my opinion, that is the most powerful part of the U.S. Army, the potential we have to exert the power we need to exert. We have to be trained for that high-end spectrum fight -- we owe it to the American people to be prepared." For junior officers just entering service, Campbell says the best way for them to succeed is to realize what it is they are in the Army to do. And that reason, he said, is the same for every officer. "The reason you exist is to serve Soldiers - that's it," he said. "Every action, deed and word has to be to serve those Soldiers, to make sure they are trained to do their jobs. The best leader is the guy that is out there trying with his Soldiers. When it gets colder, when it gets wetter, when it gets more dangerous, that's when that leader is most important, and that's where he's got to be." Campbell retires March 1, after having served nearly 37 years in the Army. He has no specific plans yet for post-retirement employment, but says he will travel south to watch spring training with the Atlanta Braves.